Northern Ireland has often been associated with the long service given by the Bristol RELL and Leyland Leopard types. When the last of these types entered service in the 1980's few people would have predicted the success of their successor chassis, the Leyland Tiger, which showed itself to be a capable performer in roles as diverse as touring coach, rural bus and city service vehicle, and has proven every bit as durable as it's illustrious forebearers. 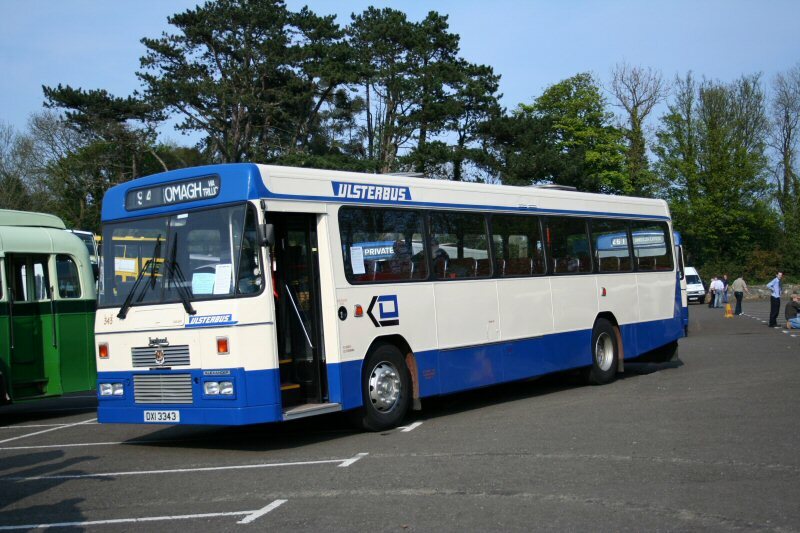 Following the cessation of RELL and Leopard production, Ulsterbus placed an order for 80 Leyland Tigers, with Alexander (Belfast) bodywork to the then new 'N'-type design. These became fleetnumbers 340-79 (DXI 3340-3379) and 380-419 (FXI 380-419). 79 of the batch were equipped with Leyland TL11 engines, with a sole bus (370) having a Gardner unit. The majority were equiped with 53 seat dual-purpose bodywork, however 10 (360-9) had coach style seats for use on express services. We are delighted to announce that this excellent example of an early Leyland Tiger was, through the good offices of Ulsterbus, formally handed over to the Trust by Translinks Acting Chief Executive, Mr Philip ONeill, at the conclusion of this years Bus & Coach Rally on Saturday 28 April 2007. Numerically the 4th of the first group of Tigers, 343 was the third to enter service, on 1st February 1984 at Enniskillen depot where it operated for the subsequent 22 (yes, twenty two) years. In January 2006 it moved to Craigavon depot, and finally left public service on 28/11/06 when it transferred to the Driving School. 343 was cosmetically restored to the 1990's style livery in early 2007, in which form it is shown above. Notably 343, has a long association with the Irish Transport Trust, having partaken in the "Tigers Old and New" tour along with PS2 515, when just delivered in 1984.